Customer Showcase: Videolean integrates Filepicker and saves time! Here at Filepicker we are constantly impressed how our customers are using our app. This week we wanted to share how Videolean is using Filepicker to enhance their app for their users. Videolean is helping small business owners to grow their business with the most powerful marketing tool nowadays: videos. Entrepreneurs want videos to promote their businesses. However, they normally can’t afford a video production company, neither have the video editing knowledge. 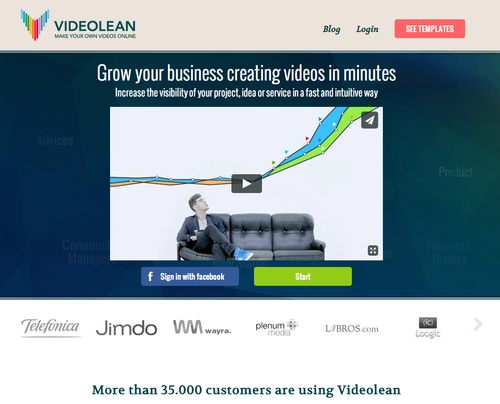 Videolean offers a wide range of professional template videos easy to customize and affordable for everyone. Select a template, type texts, upload images, select a soundtrack and you already have an HD professional video. Startups, restaurants, real state, universities, community managers, SEO agencies, marketers…you name it. Videolean is a solution for everyone who believes in the power video has to radically boost a business visibility. Images are one of the most important features to let people customize their professional template videos in Videolean. Business owners have their images in several locations such as their desktop, Facebook, Dropbox and Instagram, just to name a few. In addition, we needed to make the uploading process as easy as possible, specially since we deal with non-tech people. Filepicker turned out to be the best solution so far to let us offer the uploading images feature without barely coding anything. 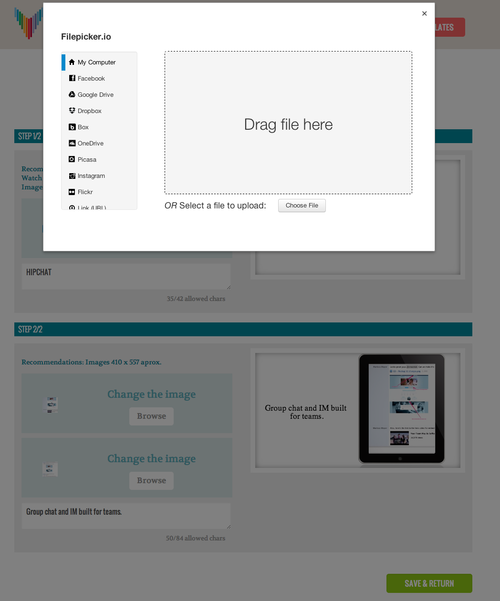 Users can customize their template videos in Videolean at the click of a button thanks to Filepicker. Creating something similar by ourselves would have taken us too much time, which we need to develop our core value. Do you have an app that uses Filepicker that you want to share? Send us a note!